Astronomers have discovered the biggest transiting exoplanet yet. 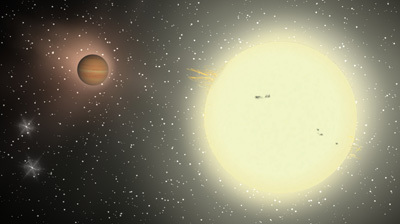 Orbiting a fading star in the constellation of Hercules, planet TrES-4 is a whopping 70 per cent bigger than Jupiter. To put these numbers in context, Jupiter is a mere 16 per cent (or so) bigger than Saturn, but is almost four times the mass. Although volume scales as the cube of the radius increases, as a planet gets heavier its increased gravity tends to collapse it inwards, and so the stepwise increase in mass is even steeper that you would expect. But the alien world has a twist in its tale: despite its enormous size, it is less massive than our solar system's biggest planet, making it roughly as dense as a cork. The planet is so diffuse, that its gravity only has the most tenuous of grasps on its upper atmosphere: the team at the Lowell Observatory who made the discovery suggests the planet probably has a diaphanous tail of material spiralling towards its parent star. "It is about 70 percent bigger than Jupiter, the Solar System’s largest planet, but less massive, making it a planet of extremely low density. Its mean density is only about 0.2 grams per cubic centimetre, or about the density of balsa wood," says Georgi Mandushev, the lead author of the paper detailing the discovery. And it the planet's density, or lack thereof, that has the boffins baffled. "TrES-4 appears to be something of a theoretical problem,” said Edward Dunham, Lowell Observatory Instrument Scientist. "It is larger relative to its mass than current models of superheated giant planets can presently explain. Problems are good, though, since we learn new things by solving them." As with all transiting planets, TrES-4 betrayed its existence by causing an observable dip in its parent star's brightness as it passed between the star and our telescopes. The transit was confirmed by the Sleuth telescope, maintained by David Charbonneau (CfA) and Francis O'Donovan (Caltech), at Caltech's Palomar Observatory.